The morning of November 3 was cold and raining, but you could feel the warmth from the hearts of the runners when Jeff Binz, UAW Region 9 Director, sounded the horn to start the 5k run. 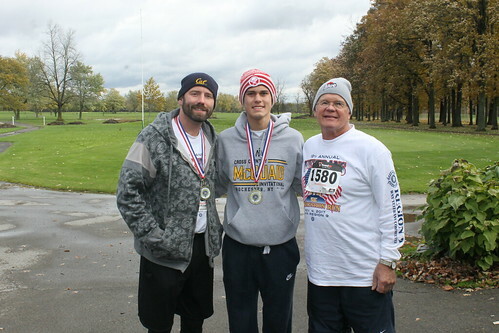 Over 100 runners between the ages of 11 and 84 braved the elements to participate in this year’s 19th Annual UAW Region 9 Veteran’s Appreciation Run in Lockport, NY. Many of the runners participate in this run every year, and each of them have their own special story for running. UAW Local 774 retiree Jim Burns was the oldest man to run. At age 70, Jim is a Vietnam War Veteran who is active in many local Veteran activities. For example, Jim participates in other Veteran runs including one where he carries a full backpack of food to raise awareness of feeding our Veterans who are not able to feed themselves. This Veteran’s Appreciation run is the largest fundraiser for the WNY UAW Region 9 Veteran’s Committee, which is made up of UAW locals throughout Western NY. This year’s run raised a total of $16,000. Guy Newell, Chairman of the committee, recently ordered a brand new 12 passenger van which the committee will donate to the VA Hospital of Bath NY later this year. This will be the 4th van the committee has donated to local VA hospitals. The previous van was donated in 2016. The local VA hospitals have found the donated vans instrumental in helping transport Veterans to and from their appointments. This is just one way the WNY Region 9 Veteran’s Committee shows their appreciation to our local Veterans.